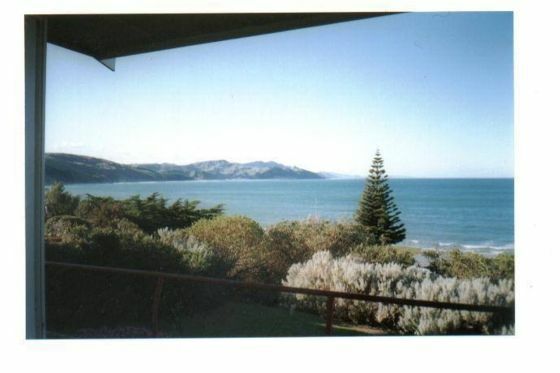 Castlepoint house offers spectacular views, walk to Castle Rock, lighthouse ; cave ; Good boat and reef fishing. Golf course at Whakataki ; 10 mins by car ; Interesting drive to northern coast and Mataikona. Photo is from the front deck of the house. ; Wheel chair access. Fully fenced property with good off street parking. ; Great panoramic view from front deck of Castlepoint bay and Lighthouse. ;Fire with firewood supplied. ;Special conditions ; Smoking allowed outside only;NOTE, Under Kiwi bach tradition you are expected to Clean the house and do the dishes before you leave; Bring your own linen ; towels ; sheets ; tea towels. We found everything that we needed for a 3 night stay and really enjoyed exploring the remarkable geographical and geological surroundings. Many of the fittings in the house are old and could do with a touch up but the stove, frig and shower all worked well. The TV was barely adequate, even to just watch the news and we couldn't get Prime. Wi-Fi would be nice. Original 1950s? 1960s? bach in a great location. An original 1950s? 1960s? bach in a great location. Unfortunately 1960s kitchen equipment too! This is a quirky old-fashioned kiwi bach that contains everything you could need for a laid back getaway. Books and jigsaw puzzles ensure that any time spent indoors is well spent if you can tear your eyes away from the amazing view. Would definitely stay again. Classic kiwi bach with stunning panoramic beach views. Perfecting situated - quiet and calm, nestled amongst the trees. Would definitely come back if I can the chance. Thank you!